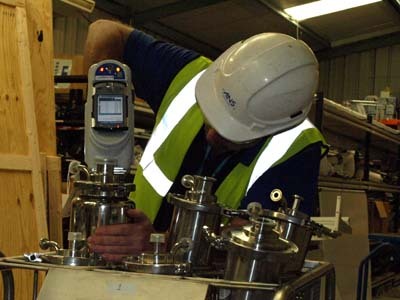 ANS Ltd. personnel have a long history in providing inspection services to the Pharmaceutical Industry, from QA/QC on new build projects, carrying out FAT and Pre-FAT inspections on Vessels, Skid Units and other items of Plant and Machinery to maintenance inspections and failure analysis. ANS offer a wide range of inspection equipment to facilitate the validation of items of plant and equipment to ensure that Client requirements, the requirements of ASME BPE and other specifications have been met. ANS offer inspection, compliance testing and documentation validation of items of plant during construction and prior to shipping. Our Field engineers have performed inspections on vessels, skid units, filter housings, autoclaves, down flow booths, heat exchangers and various other items of plant and equipment for the Pharmaceutical Industry. 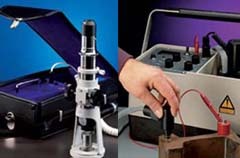 Walk downs of P&IDs, measurements to verify slope requirements, PMI (Positive Material Identification), Surface Roughness (Ra measurements), Ferrite measurement, visual borescope inspection of welds and review of radiographs. Documentation review is a critical part of the inspections, performed to ensure that all items and components are fully traceable back to original material test certificates. That all procedures for manufacture, inspection, cleaning, flushing, polishing and passivation are in compliance with codes, specifications and vendor documentation requirements. Welds on pipes, vessels, and other items of plant and equipment must meet the strict requirements of ASME BPE. Welding must be fully controlled from pre-fabrication qualification of weld procedures and operators through the manufacturing process to final finishing and polishing. ANS have provided compliance testing of welding with various materials typically used in the pharmaceutical industry such as Stainless Steels, AL6XN and Hastelloy. Welding if not qualified, controlled and inspected during fabrication has the potential to pose serious risk to items of plant and equipment.